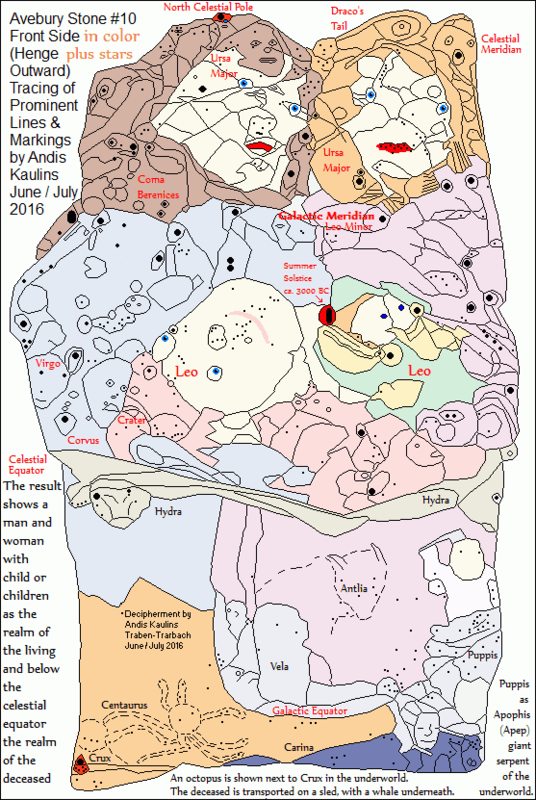 Avebury Stone #10 Front Side Deciphered by Andis Kaulins, July, 2016. If things interest you here, you might consider joining our LexiLine Forum at ProBoards. What do we teach, and what do we learn? Teaching and learning are extensions of the field of knowledge. To teach anything, we have to KNOW something. But how do we know what we know? And how much of what we know - or think we know - is really true? and in fact changes from year to year and decade to decade. Many things thought to be "known"
are discarded over time by new knowledge. Too many things in science and scholarship are taken for granted as facts based on somebody's "say-so". Indeed, in archaeology, there is an unwritten rule that for the first 10 years (!) only the finder of an artifact can publish about it. Of course, there is no guarantee that a finder is also competent to interpret correctly what he or she has found, so this practice allows original erroneous interpretations to become fixed over time by default, later to be adopted as givens simply on the "say-so" of the original finders. It is a very strange practice that leads to errors. and using "hearsay" is not very good evidence. e.g. one professor quoting another professor, etc., etc., often over generations. That may please the academics, but it leads to many serious errors. which simply become entrenched over time. 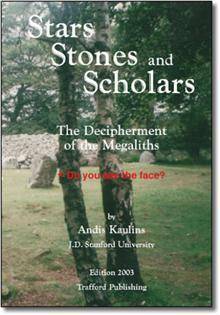 about ancient cultures and the history of civilization? actually tell us about man's past? is evidence that tends to prove or disprove a stated thing. In law, anything other than probative evidence in not admissible in court. Most of the evidence relied on by mainstream historical research would be thrown out of court without question as inadmissible, because that evidence simply does not say what scholars say it does. Archaeology provides a good example of how scholars rely on non-probative evidence to draw far-reaching conclusions which down the road are actually proven by probative evidence to be totally wrong. "In 2001, archaeologists discovered a ship sunk in the middle of the Mediterranean, surrounded by amphorae. From this they concluded that the ancient Greeks actually HAD sailed offshore. What's remarkable was that until this discovery, they'd been convinced that they DIDN'T. Why? Well, because they found all the wrecks near shore. This ignores several important things: (1) Wrecks tend to HAPPEN near shore -- that's where the rocks and shoreline are. (2) Near shore was where they were looking for the wrecks. (3) The written record documents many long sea voyages, but these were all discounted as fanciful. (4) Crete is out of sight of the mainland, and yet Greece traded with it. Makes you wanna [...], no?" 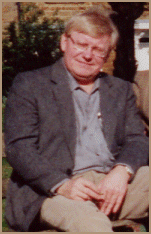 The above example mirrors faulty mainstream methods in many of the "soft sciences", especially Archaeology and attendant fields such as Biblical Studies, Egyptology and Near Eastern Studies, all of which have led mainstream scholarship to adopt many erroneous views of man's history. The case of Biblical Moses is a good example. to the life of Moses and the Exodus of the Hebrews from Egypt. ZERO. Not a single pot. are driven by prevailing historical judgments about the Jews. And those judgments are false, demonstrably false. 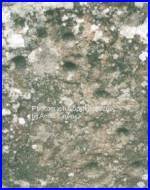 at a time when his existence is supported by archaeological probative evidence. is in large part simply terribly false. 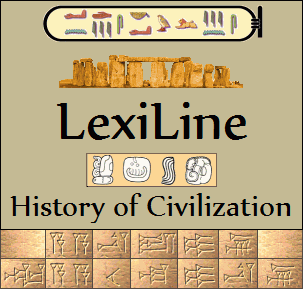 Such historical problems are the focus of LexiLine. and we draw our attention to these problems as we find them. regardless of what the correct answer may turn out to be. that our OWN views must be classified as "speculative"
who have not contradicted them, which would be hard to do. and a different tale than what is learned in the schools. That is why we call LexiLine a Renaissance in Learning. but the odds are GREATLY in our favor. Greatly. Enjoy your reading of this website | Quick Index of LexiLine.com |.